As I reported in Experimenting with Assessments I wanted to attempt some alternate assessment options in my American Government Class this semester, so I launched an experiment during our first unit. 1) Only about 15% were inclined to do the projects and their numbers were halved as the deadline approached for the project. They decided to take their chances with the test rather than invest energy in a project. 2) The two project alternatives attracted equal interest. The slides tended to be better, but two of the students disregarded basic directions. 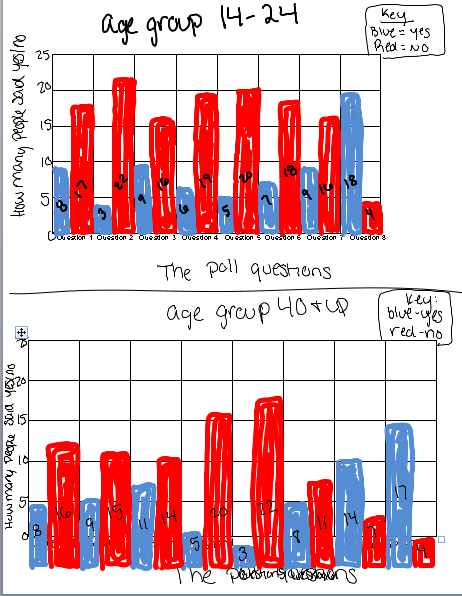 The surveys were consistently executed well, but only one student (who sought feed back ahead of time) actually got at the main concept ("legitimacy" that lay at the root of the assignment. I am pleased to know that a few kids really responded to the project options and got more out of the projects that simply going ahead and bombing another test. But before I try something like this again, I need to retool. 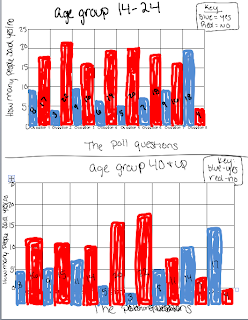 A student's survey results pictured above.